Enth Degree Mens Nekton Hooded long-sleeved thermal top is both in an inner and outer garment, but it truly shines in combination with a wetsuit. The Mens Nekton Hooded thermo-top with long sleeve keeps you warm even in the windiest condition thanks to the hydrophobic outer cover of the Fernotherm3 and hood. The hood itself is naturally warm, but a large part of the heat is generated by air trapped by your hair, and the hair itself. The Enth Degree Mens Nekton Hooded long sleeved thermal top is ideal in all applications that require maintenance of core body-temps - life? Running the Nekton on the outside of your diving suit, especially a scuba dive steamer, will greatly improve the overall heat as cold water can no longer enter your body cavity via the zip. 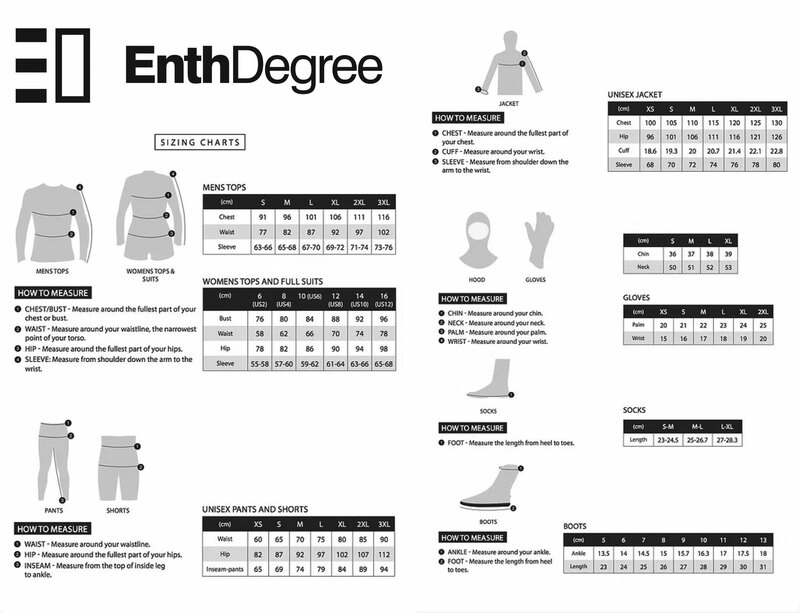 To get the most out of your Enth Degree thermal we recommend maintaining it with Wetsuit Wash.